(...) This issue we have 13 fab patterns for you to get stuck into, included Martin Storey’s gorgeous cherry-red and cream cardigan (pictured on the cover), and Hélène Magnússon’s boldly patterned cowl-neck sweater. 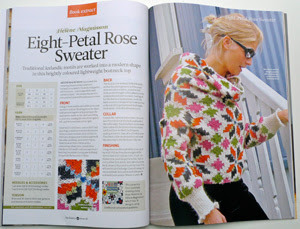 Designer Hélène Magnússon’s takes us on a personal journey around the vibrant knitting scene of Iceland, and Juliet confesses all about her year-long abstinence from buying yarn! 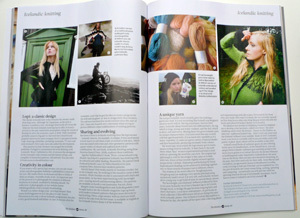 I was delighted when The Knitter contacted me to write an article about the Icelandic knitting scene. Hope you like it too! 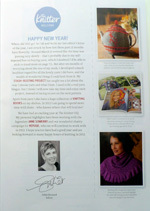 I also have a pattern from my book there and I'm very proud to see my name associated with Martin Storey on The Knitter blog page! J'étais ravie lorsque The Knitter m'a contacté pour écrire un article sur le tricot islandais. J'y ai aussi un modèle de mon livre et je suis très fière de voir mon nom associé à celui de Martin Storey sur le blog de The Knitter! 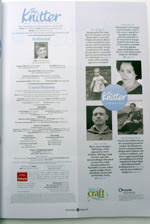 A great article, thanks Helen!